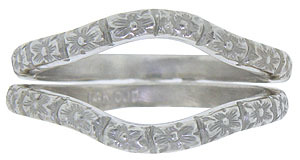 A garland of impressed flowers dance around the face of these 14K white gold curved wedding bands. Photographed here with R2522 (sold separately). 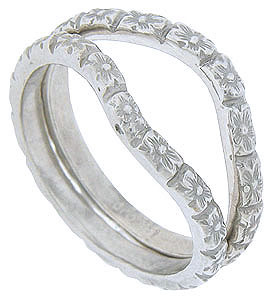 The antique style curved wedding rings measure 2.06 mm in width. Size 6 3/4. Cannot be re-sized, but we can order in other sizes. 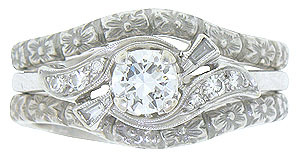 The bands are frequently purchased as a set for $550, but are also available individually for $275.